In May, the Northern Lake George Rotary members again participated in 9N road cleanup to help beautify our lovely area. At the end of May we marched in the Hague Memorial Day parade. In June, Club members provided water, snacks and directions to several hundred Americade motorcyclists as they crossed over the Tongue Mountain. In June, The Northern Lake George Rotary Club donated $1000 to an outstanding senior at Ticonderoga High School (the Robert and Helen Rotary Scholarship). The recipient for 2016 is Willa Shankshift (way to go!). Picture below shows Dave Cornell (Treas) after presenting award to Willa. Willa plans to attend Hartwick College and study Art History. The Rotary Club of Northern Lake George also provides a yearly grant to the Beste Scholarship which is awarded annually to aspiring Hague students to assist them in their pursuit of higher education. At the end of June 2016 we held the Rotary Changeover Breakfast. This event was opened by President Diane Dickson and John Crawford (former District Gov). See top photo. At this event our new co-presidents, Susan McTyier (right) and Julie Cook (left), were installed (see middle photo). And the bottom photo, shows Mike Cherubini receiving the Rotary Community Service award from Carolyn Close (Secretary). Also Dorothy Brauner and Pat and Joe Wania were sworn into the Northern Lake George Rotary Club as new members. Welcome Dorothy, Pat and Joe! Top photo below shows former President Diane Dickson swearing in Dorothy and second is photo of Pat and Joe. Another new member, Mona DiMarco, was sworn in on October 4, 2016. Welcome aboard, Mona! In Sept, Our club provides an annual grant of $500 to the Ticonderoga Middle School Music Department to assist with the purchase of musical instruments. The Northern Lake George Rotary also provides annual grants to the Silver Bay YMCA to help them with planned expansion and improvement projects. See photo to the right taken in June 2015 showing Bob Johnson presenting check to Steve Tamm, Silver Bay CEO,Kim Pacala (Capital Campaign), Mike Rama (Annual Fund). 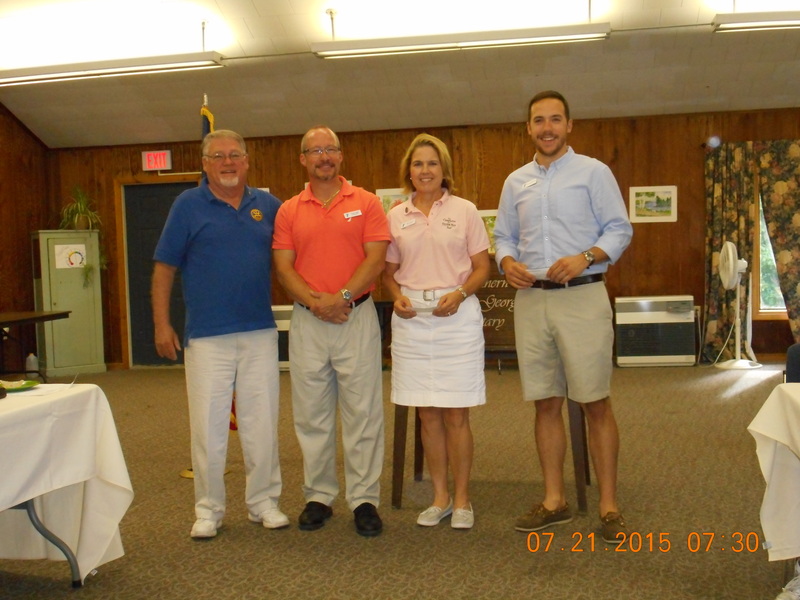 In addition, the Northern Lake George Rotary also made a contribution to the Silver Bay Campaign. 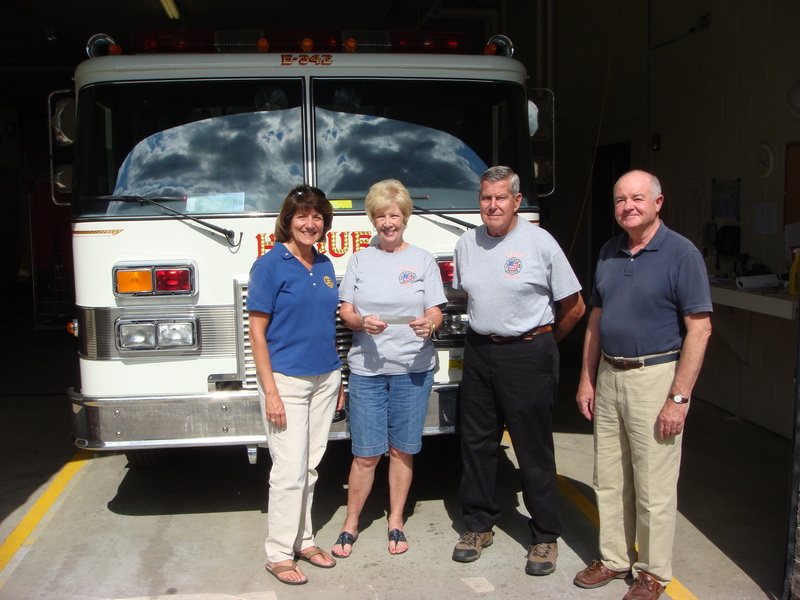 The Northern Lake George Rotary Club also provides donations to the Hague Volunteer Fire Department in appreciation of their dedication to the protection of the Hague and Silver Bay communities . Photo to the left shows Ray Mury(Chief HFVD) and Linda Mury (President HVFD) accepting check from Rotarians Jean Yager and David Cornell (Treas) . The Northern Lake George Rotary Club also donates to the Ticonderoga Festival Guild in support of the development and education of the arts in the area. The Rotary International Dinner was held on Tuesday SEPTEMBER 6, 2016 AT SILVER BAY (GULLEN HALL). Thanks to all our generous supporters, this event was a big success. Please join us again next year (Sept 2017) for interesting international cuisine and wonderful company. On September 17, 2016 , at the Hague Octoberfest, we picked the winning ticket for the Hornbeck Canoe. The winner was John Linden…. congratulations!! He has picked the canoe up and plans to use as soon as possible. 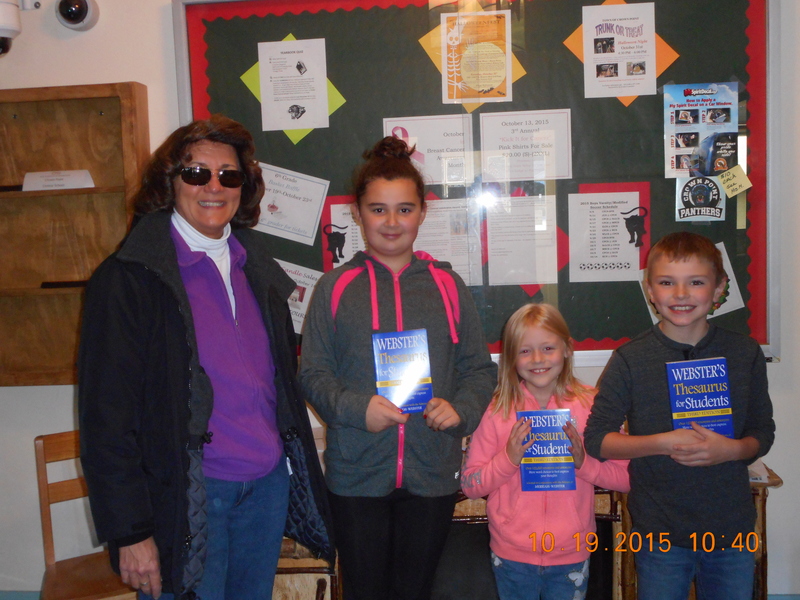 The Northern Lake George Rotary submitted a grant request to the District in March 2015 and was awarded a partial grant in September to purchase Thesaurus books for local schools. With additional funds donated from the club, we were able to purchase nearly 200 books to donate to the schools. 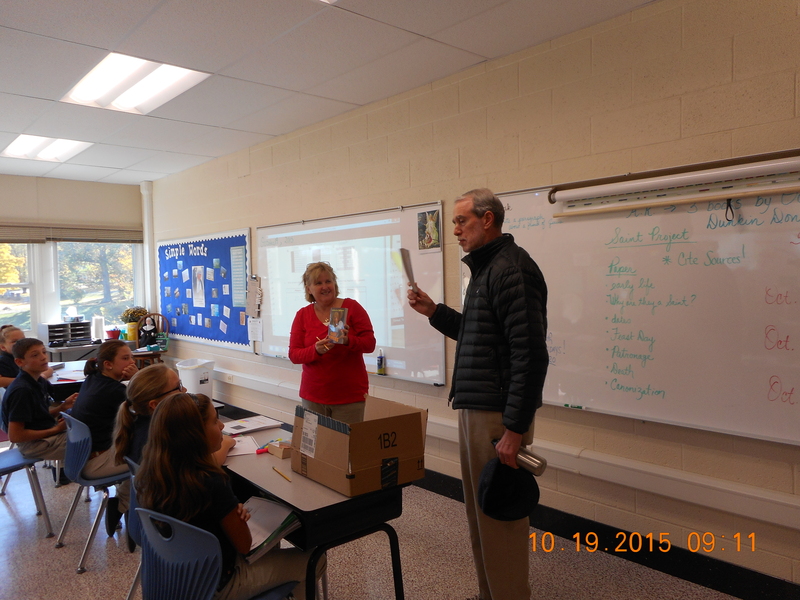 On October 19, 2015, rotary members, Jean Yager and John Towey delivered Thesaurus books to the Ticonderoga elementary and St. Mary’s elementary schools. John made an additional donation of 17 Katherine Paterson books (The Great Gilly Hopkins) to the sixth grade class at St. Mary’s School in Ticonderoga. Afterwards, Jean went on to deliver Thesaurus books to 4th grade students at Moriah, Crown Point, Schroon Lake, Bolton Landing, and Putnam elementary schools. Pictures to the left show Jean with 4th graders after donating thesaurus books to Crown Point. The second photo shows John distributing the Paterson books to St. Mary’s School sixth graders. Another grant request has been submitted this year and we hope to again provide Thesaurus books to seven local schools. As fundraisers to support charitable projects in 2017, Rotary will be holding a Christmas Party/Auction in December; a silent auction during the Hague Volunteer Fire Dept breakfast in Feb 2017; we also will be raffling another Hornbeck Canoe in the Spring-Summer 2017; and we will be planning another Rotary International Dinner (Sept 2017). The Club meets on the first and third Tuesdays (7:30 AM) at the Hot Biscuit in Ticonderoga during the winter season and the club meets weekly Spring thru Fall at the Watson Arts Center, Silver Bay YMCA. Please join us!